William had ten children, and two of his sons, James (baptised Burley Parish Church 1814), and Thomas (baptised Burley Parish Church 1817), appear to have succeeded to Burley in Wharfedale forge somewhere between 1840 and 1845. Thomas was certainly living in Back Lane, Burley, in 1844 when his son William was born. After Thomas left to start Woodhead forge, in about 1850, Burley forge continued under James and his descendants. 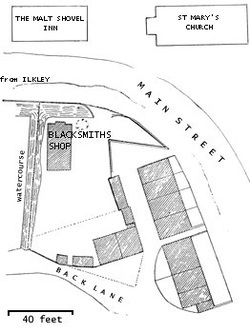 A plan of the forge (left) shows a single storey building about thirty feet long, set on the corner of a sharp bend in the road opposite the Malt Shovel Inn and St Mary's Church. The forecourt contained a circle of large stones upon which the wooden cart wheels were placed before the heated iron hoops were hammered on to them, and quenched with water drawn, no doubt, from the adjoining beck. The forge was in operation until just before the Second World War, when modern engineering methods began to supersede the traditional blacksmith's craft. Burley forge eventually passed to James's son, William (born 1842), and then to his grandson, Samuel (born 1871, died 1937). Samuel's son, ‘Charlie’, acted as striker for his father in the latter day’s of the forge, and was reputed to be quite a ‘character’, but he did not continue the business after Samuel died.